Project was successfully launched in April 2014, kindly supported by the Norwegian Ministry of Foreign Affaires was received. As a part of the UNINI (Ukraine Norway Innovation Networking Initiative) project 4 iHUB centres for innovation and entrepreneurship are currently operating – in Kyiv, Lviv, Chernihiv and Vinnytsia hosting and having hasted some 381 innovators and entrepreneurs as residents and alumni residents across Ukraine, having conducted some 350 trainings and having trained almost 5,000 people. iHUBs provide a conducive business environment to young entrepreneurs, including education, community, work and study space and access to investors. This project is supported by the Ministry of Foreign Affairs of the Kingdom of Norway. 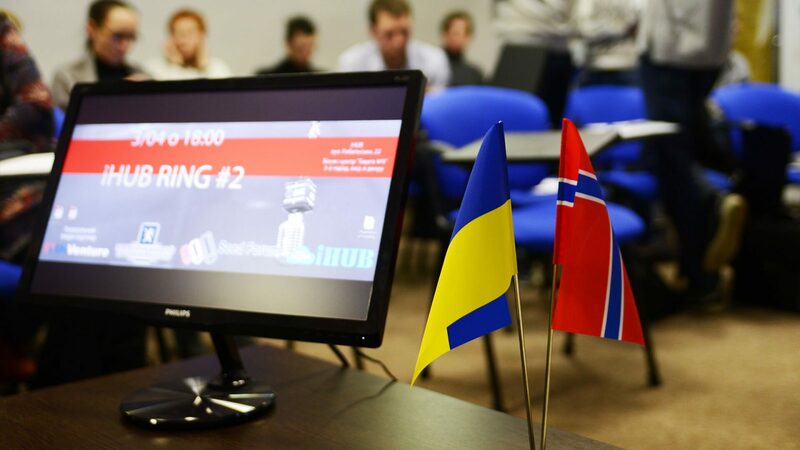 Ukraine possesses vast intellectual potential, particularly in ICT and tech. Therefore, Seed Forum coordinates projects fulfilled by Seed Forum Ukraine Foundation (Seed Forum) with the support of its donors to ensure maximum effectiveness in the enhancement of business environment particularly for startups, SMEs and specialists in ICT and tech, technology, and innovation based sectors of the economy, striving to maximise the potential of the country. Today in Ukraine SMEs account for only 10-15% of GDP, compared to an average of 50+% in Western Europe. As the 3rd largest country for ICT and tech freelancing in the world – Ukraine is world renowned for its ICT and tech and engineering specialists, and already now it is a global hub of exceptional technical talent. Ukraine takes 1st place in the world according to the number of certified ICT and tech specialist per capita. Ukraine has the largest and fastest-growing number of ICT and tech professionals in Europe; its ICT and tech engineering work force is expected to double to over 200,000 by 2020. The export volume of Ukraine’s software development and ICT and tech services reached at least $2.5 billion in 2015 (3rd largest export sector), showing double-digit growth year after year. Ukraine is home to over 100 R&D subsidiaries of global companies from a variety of industries, including telecoms, software, gaming and e-commerce. Ukrainian developers often work on mobile, software, enterprise and web projects in a variety of verticals. A range of providers have built their reputation in solving complex engineering tasks. More than 1,000 ICT and tech outsourcing companies with 90,000+ specialists are involved in the ICT and tech outsourcing industry and majority of Ukrainian ICT and tech specialists (est. 70 %) work for American or European customers. Overall, today there are more than 3,000 ICT and tech companies from which 1,000 are ICT and tech companies and 2,000 are startups operating in Ukraine, with over 250,000 specialists involved. The number of ICT and tech specialists has grown by 20% over the last year and the industry shows no sign of stalling. On average 30,000 graduates from 100 universities in Ukraine join the ICT and tech workforce each year. Ukraine is in first place across all of Central and Eastern Europe according to the number of technical graduates entering the labour force each year. Most of the graduates possess strong technical knowledge but lack business and management skills to monetise their potential outside of outsourcing to move up the value chain. At the same time, the cost of highly qualified ICT and tech labour in Ukraine is at the low end in Eastern Europe. Leveraging engineers from software outsourcing industry, who bring in ideas based on their familiarity with prod-ucts on global markets, the ICT and tech startup sector in Ukraine is well positioned to show dynamic growth in the future given proper support. One of the goals of Seed Forum therefore lies in helping the vast amount of highly skilled and talented programmers to create their own companies, products, services to cater to Ukrainian and international market. Ukraine Norway Innovation Networking Initiative (UNINI) project operated by Seed Forum and Seed Forum Norway Foundation fulfils the mission to build and develop a vibrant ecosystem of innovative entrepreneurs and startup companies across the nation, and strengthen the image of Ukraine as a progressive and integral part of the global high-tech economy. Regional innovation partnerships and infrastructure secures local commitments and organisational solutions on local level. Entrepreneurship and start up services provides support to entrepreneurship development. Commercialisation of technology develops and tests concepts for commercialization of technology from Universities and research institutes and universities in Ukraine. International business development applies the business acceleration process that consists of developing market access and facilitating business partnering. Access to finance includes establishment of an interplaying mix of instruments to improve access to finance for entrepreneurs in Ukraine. Techno park in Kyiv has the main objective to develop a decision platform to finance and implement a Techno Park in Kyiv. Project management includes strategic and executive management.